Since 2013, Help Teaching has brought you our Top 100 Free Education Sites. We’re continually updating our list to provide you with the best resources. Not only can you find the top free sites for teaching math, science, English, and social studies, but we’ve also added some of our favorite computer science and coding sites, language sites, and this year we’ve also added our favorite homeschooling sites. No time to go through the whole list? Just use “Quick Links” section to jump straight to the section that interests you and bookmark this article for a reference later. Whatever the grade-level or subject area, these websites have something to offer. From high-quality lesson plans to entertaining games and educational videos, they represent some of the best educational websites in existence. Code.org has gained recognition with its Hour of Code initiative. The website offers free, easy lessons to help kids learn some of the basics of coding. The lessons also help teach critical thinking and problem-solving skills. Google is something most teachers know about, but many haven’t taken the time to explore all of their awesome free resources for education. There are some fun activities too, such as Build with Chrome where kids can build with LEGO-style blocks online. FunBrain helps students learn through fun games related to math and reading. They’ll also find books and other entertaining resources. Scholastic has developed a reputation for its high-quality educational books and materials and its website does not disappoint, offering lesson plans, interactive activities, and articles designed to help teachers and parents. Gooru helps students take control of their own learning by providing them with information about how they learn best. Edutopia focuses on helping educators grow. From articles and blogs from those working in the field to informational videos and classroom guides, educators in all areas of education will stay on top of the latest trends and find tips to help them improve. DIY.org encourages kids to learn new skills. Teachers and parents can challenge them to set goals and complete tasks on the site. Edudemic helps teachers with technology. Both technology experts and those just getting started will find plenty of tips and resources on this site. Teachers Pay Teachers isn’t technically a free site since teachers sell materials. However, there are plenty of free downloads on the site. You may find hte perfect free worksheet, lesson lan, or classroom time-filler. Ted-Ed goes beyond traditional Ted Talks by offering lessons to accompany many of those videos. In addition, you’ll find animated videos and resources for elementary,middle, and high school students too. Every day, in classrooms around the world, kids are learning how to code. Coding is a valuable skill that helps teach kids to think logically and develop the critical thinking and reasoning skills they need for our increasingly technological world. These resources offer free coding activities for kids. Code.org is home to the Hour of Code. In just an hour, kids can complete a fun coding game. There are many games to choose from, including those that feature popular characters kids love. Tynker offers its own free Hour of Code activities and games for kids to enjoy. CodeCombat is an online, multiplayer game that requires kids to write code to play. Kodu Game Lab is a visual programming tool that kids can download to create games of their own. CS Unplugged teaches the principles of coding, but not in the traditional way. The site offers a large selection of offline activities designed to help kids develop these critical thinking skills. Find games and activities for early readers, as well as texts for advanced readers, in this collection of high-quality reading websites. In addition to these sites, Help Teaching offers a large collection of public domain and original reading passages organized by grade-level, word count, and Lexile level. CommonLit contains a wealth of free fiction and non-fiction texts for use in the classroom. Texts are organized by grade-level and theme. Media Literacy Clearinghouse introduces students to a new type of literacy – media literacy. With all of the new technology and messages appearing every day, it’s important for kids to be media literate. Awesome Stories uses non-traditional reading materials, such as biographies and primary source texts, to get students learning through reading. Students can use the site to help with research and teachers can use the texts as part of lesson plans. Creating an account allows users to access audio versions of many of the titles as well, making it an ideal site for auditory learners and those with learning disabilities. ReadWriteThink gets students to participate in critical thinking and reading activities through its lesson plans and interactive student resources. Book Adventure is a free online reading program that provides students with incentives for reading. Bookopolis is essentially a GoodReads for kids. The site allows students to read reviews written by their peers and helps them find the perfect book. Whether students need an outlet for their creative writing or want to brush up on their grammar skills, one of these resources will get the job done. ToonDoo gives kids a place to create their own cartoons and store them online. It features tons of clipart and other artistic effects to make the comics visually appealing. Voki features animated characters that students can customize and manipulate to speak their words. It’s a great tool to help with creative thinking, writing, and storytelling. Grammar Bytes tests students’ knowledge of grammar through simple multiple-choice activities and rewards them with cheesy virtual prizes. Purdue OWL is an online writing lab from Purdue University that provides students, particularly those in high school and college, with everything they need to know about writing a paper, including grammar advice and paper formatting guides. Teachers can find primary source documents and high-quality lesson plans, as well as discover ways to connect students to history, geography, government, and other areas of social studies online. Chronas is a new history resource that seeks to give students a better understanding of history. It organizes Wikipedia information visually and chronologically to create a unique digital textbook. GeoGuessr tests kids’ geography skills. Using images from Google’s Street View, it plops players down in the middle of the street and asks them to figure out where they are. National Archives: DocsTeach allows teachers to incorporate primary source documents and other historical texts into a variety of critical thinking and thought-mapping activities. Pre-made activities are also provided. Students can complete the activities online or through the DocsTeach app available for the iPad. iCivics offers high-quality and engaging games for students to play while they learn about civics. Lesson plans help teachers incorporate the games in the classroom. Sutori gives students the chance to create free interactive timelines and engage in collaborative learning. What Was There? allows students to type in any city, state, or country to view an archive of historical photographs and other documents. It’s a unique way to help them learn about history. Not all websites focus on elementary math skills. While many of these games do work well for elementary-age students, they also offer games and lesson plans for students tackling subjects such as algebra, geometry, and calculus. Math is Fun is full of math resources for kids and teachers. It also includes an illustrated dictionary of math terms to help students understand difficult concepts. Numberphile features short videos about numbers. They help kids explore complex math topics and make math more fun. Math Games offers a large collection of math games and questions organized by grade-level and skill. It also includes a progress-tracking feature so teachers and parents can see what kids know. AAA Math features online interactive math lessons for students in kindergarten through 8th grade. Yummy Math connects math with the real world through timely news stories and other reading passages. Math Forum offers online professional development opportunities and other resources to help math teachers improve their skills. Help students understand science with this collection of videos, games, experiments, and creative science activities. PhET features many engaging simulations to help kids learn difficult concepts in science and math. Wonderopolis shows kids a wonder of the day, and then gives them a chance to test their knowledge or join in on a discussion related to that wonder. Kids will be surprised by all of the cool facts that they learn and they may spark some interesting discussions in the classroom. Molecular Workbench contains hundreds of simulations, curriculum models, and assessments designed to improve the teaching of science. Science Made Simple gives kids science experiment ideas and other science project topics. It also offers help when preparing for a science fair. The Science Spot offers lesson plans, activities, and student examples from one teacher’s science classroom, as well as daily science trivia challenges and daily science starters. BioDigital is a human visualization platform that allows students to explore the human body in really cool ways. For even more science-specific resources, check out the Ultimate Guide to Teaching Science. Art museums around the world have made it their mission to teach students about art. These websites introduce students to art theory, let them explore classic works of art, and even give them the chance to create art of their own. Artsonia bills itself as the world’s largest kids art museum. All of the artwork has been created by kids and, while the site is free, parents can also purchase products featuring their kids’ artwork. Artsology helps kids learn to appreciate the arts by providing them with the opportunity to play games, conduct investigations, and explore different forms of art. NGAKids Art Zone allows kids to explore popular art movements, themes, and artists and offers guides to help teachers as well. Tate Kids gives kids a chance to explore famous works of art, play art-related games, and even create their own works of art to add to their online gallery. Encourage kids to think beyond One Direction and their other favorite artists and experience new types of music. Kids can learn about the symphony and classical music or even build their own musical skills by learning through ear training or playing instruments online. Andrew & Polly is an indie children’s music duo that has created a podcast called Ear Snacks designed to help kids learn through music, sound, and unique experiences. Classics for Kids regularly highlights famous composers and provides teachers with activities to use in the classroom. KIDiddles has lyrics and audio files for over 2,000 kids songs for music teachers, or any teachers, to use in their classrooms. Good Ear may not look like an awesome site, but it contains a lot in its simple design. This website provides virtual ear training to help serious student musicians learn to recognize the differences between notes. Virtual Musical Instruments lets kids play instruments online. Instruments include the guitar, piano, pan flute, drums, and bongos. Health and safety are important to kids. Whether kids want to know more about keeping their bodies healthy or staying safe online, these websites have them covered. KidsHealth is the top website for kids to learn about their bodies and their health. It features easy-to-read articles and kid-friendly graphics to help kids learn about a whole host of topics related to health and safety. CDC BAM! focuses on teaching kids about their bodies. BAM stands for body and mind and all of the resources on the site help kids learn more about their bodies and keeping their minds sharp. NetSmartzKidz and its sister site, Netsmartz, promotes online safety. Kids and adults can learn all about staying safe online and avoiding dangers such as cyber bullying. StopBullying.gov helps prevent bullying in all forms by providing teachers, parents, and students with resources to educate them about bullying and let them know what to do when bullying occurs. PE Central is a physical education teacher’s ultimate resource. It includes lesson plans, assessment ideas, and other resources. Don’t forget about your younger learners too. Many websites, including our own Early Education collection, offer games and activities designed to help toddlers and preschoolers build their basic skills. Preschool Express is full of crafts, activities, bulletin board designs, and finger plays for early education teachers and parents to use with kids. Starfall promotes beginning reading and number skills with fun stories and activities. Funbrain Jr. brings the fun and quality of Funbrain to a younger audience with its early learning games. Songs for Teaching offers a large selection of fun songs to help teach preschool students. Super Simple Learning’s resource section includes free flashcards, coloring pages, worksheets, and other resources for children, teachers, and parents. Kids love to play games online. Why not encourage the practice by introducing them to some fun educational games websites? They’ll have fun and you’ll know they’re learning. Arcademic Skill Builders offers a series of racing games for kids focused on math and ELA skills. Best of all, many of the games are multiplayer so kids can create rooms and play against their friends. Quizalize lets teachers turn content into fun quiz games for students. It’s free to create quizzes, but teachers can also buy inexpensive quizzes from other teachers in the marketplace. Cool Math Games is the ultimate site for kids who want to play math-oriented games. These arcade-style games are a lot of fun and many accompany the lessons found on the site. Primary Games has a lot of educational games for kids to play mixed in with some “just for fun” games too. All of the games are kid-friendly. Games for Change gets kids thinking about problem-solving and social issues by providing them with unique games to play. Many of the games help kids solve world problems or introduce them to social issues. It’s important to keep up with the news. These websites cover the latest education news and also provide kid-friendly news sites to use with students. Education World’s main page highlights the latest news in the world of education, including interesting research and controversy. Education Week publishes a weekly newspaper all about education. Its website highlights many of those stories so you can access them for free. Smithsonian TweenTribune features unique news stories for kids. Stories are organized by Lexile level and cover topics related to kids’ interests. Time for Kids gives students and teachers access to many of the articles from Time for Kids magazine, even if they don’t subscribe. Stories focuses on world news stories and pop culture. DOGO News promotes “fodder for young minds” by sharing unique news stories, including stories of people doing good around the world. With the introduction of open courseware and TED talks, educating yourself online has never been easier. Find access to actual college courses and learn what you want to know from the experts in the field. At HelpTeaching, we have launched our own line of online K-12 lessons that students can use for self-directed learning. TED features videos and other resources from some of the world’s greatest leaders, innovators, and thinkers. If you want to learn more about a particular field, chances are there’s an expert talking about it. Khan Academy offers free online courses in a wide variety of subjects. It offers the most content in math, but also has courses in science, economics, test prep, and more. Open Education Consortium allows you to search for open courses around the world. It also provides news on the open courseware movement. MIT OpenCourseWare gives you access to courses from one of the nation’s most prestigious colleges. Coursera helps you find and sign up to take free online courses from some of the world’s top universities and other experts. Youtube has been around for a long time, but that only supports its awesomeness. You’ll find a lot of video tutorials on everything from fixing a car to learning how to beat a difficult level on Angry Birds. Don’t forget to check out Help Teaching’s YouTube channel with online lessons too. For more resources, don’t forget to check out the Ultimate Guide to Self-Learning for Kids and the Ultimate Guide to Self-Learning for Teens and Adults. For general homework questions and help studying for that big test, students should check out this collection of websites. Teachers will also find study skills lessons to go over with students in class. BJ Pinchbeck’s Homework Helper features information, resources, and links designed to help students with their homework, as well as resources for parents and teachers. HomeworkSpot provides students with links, resources, games, and reference materials to help them build their skills and complete their homework. Fact Monster Homework Center connects kids with reference materials and tools to help them successfully complete their homework. Shmoop offers homework help, literature guides, and a ton of other resources for students. The site’s writers incorporate a lot of humor in their writing too, making the site incredibly entertaining. Howtostudy.org features articles on different study skills and test-taking strategies. There’s even a subject-based “How to Write” section to help students learn how to write all kinds of informational texts. Don’t forget Help Teaching’s Study Skills and Strategies worksheets either! Lesson planning can be time consuming, but with high-quality pre-created lesson plans, lesson plan templates, and a place to store their lesson plans, teachers can simplify the process. The Differentiator provides teachers with lesson plan ideas to help them incorporate higher-order thinking skills, change up the products students create, and add to the resources they use. This helps ensure teachers aren’t presenting the same lessons all the time and that they reach students in many different ways. Buck Institute for Education (BIE) helps teachers learn more about project-based learning. It also offers a collection of PBL activities for teachers to use in the classroom. Makerspaces.com provides teachers with tips, tricks, and resources to create a Makerspace in their schools. ShareMyLesson offers lesson plans and other resources shared by teachers, educators, and educational companies around the world. If teachers want students to learn, they must have good classroom management. These resources help keep students in control and encourage behavior that promotes learning. ClassDojo is a classroom management system that allows teachers to set goals for students, track their progress, and reward them for that progress. Parents can also access reports to see how their children are doing. Remind gives teachers a free, easy, and safe way to share important information with parents and students via text message. All phone numbers are kept private and parents must opt-in to receive messages. BouncyBalls is an online game where the noise level makes the balls bounce. The more balls bouncing, the noisier the classroom is, reminding students to quiet down and focus on their work. NEA Classroom Management offers a classroom management survival guide, as well as articles and resources to help with specific areas of classroom management. Super Teachers Tools contains free resources such as seating chart makers and countdown timers that can help teachers implement solid classroom management strategies. Whether students are looking to learn a foreign language or improve their English language skills, these sites are designed to help. Internet Polyglot offers free videos, games, and other resources to help language learners memorize words in a new language. It also offers over 4,000 vocabulary lessons. Busy Teacher features thousands of articles, worksheets, slideshow presentations, and other resources designed to help English language learners and teachers. All resources are available to view and download for free. Google Translate is a free translation service provided by Google. You can translate a few words at a time or a whole document. While not 100% accurate, it can be a good place for language learners to start. Open Culture contains a collection of the best free language learning courses and resources online. Homeschool curriculum can be expensive. Thankfully, there are plenty of free resources out there to help offset the cost. You’ll also find lots of tips, tricks, and other resources to help make your hoeschooling journey successful. Homeschool.com bills itself as the #1 resource for homeschooling and with good reason. The website is full or articles about homeschooling, local homeschooler groups and even free curriculum and homeschool mom planner. Beestar offers online elementary math and reading exercises. With a free account, kids can access a set number of free worksheets a day. There are also competitions kids can enter for a small fee. Brainly gives students a place to ask questions and get answers. Think of it as a moderated Reddit or Yahoo! Answers for kids and teens. Most of the content on the site is free, although some verified answers require a subscription. CK-12 is a platform that offers free online textbooks and resources for students and teachers. Why pay for curriculum when you can get free, customized resources online? Hillsdale College provides free online courses to help people learn more about the principles of American democracy and study some of the authors and artists who were part of America’s foundation. Did you favorite sites make the list? If not, share them in the comments. 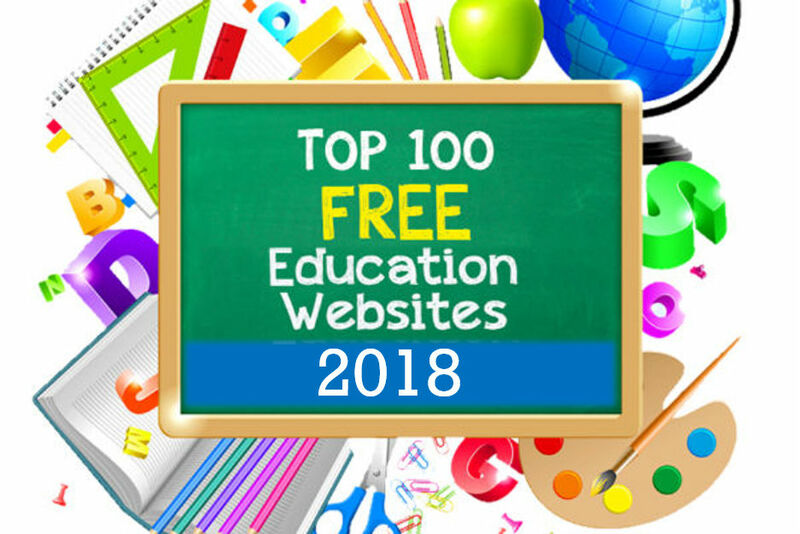 Maybe they’ll make 2019’s list of the 100 Best Free Education Sites. Remember to check out Help Teaching for all of your worksheet and printable needs too. PE Scholar is a free community website for the sharing of high quality physical education resources lesson plans and more! Thanks for the great post! Educators across the globe have gone to computer software to enhance student learning. Thank you for sharing this awesome list of resources! I am just starting to teach conversational English in private lessons after having requests from my podcast listeners (The Real English Conversations Podcast). Although most of them are interesting in having conversational English lessons, which are fairly easy, some want to practice specific things. It can be time consuming finding good resources to use for the lesson. Some of you may find my website, Real English Conversations, to be a useful resource to help students with listening comprehension and understanding of conversational American English. Check out Citizenship Counts, founded by Holocaust survivor Gerda Weissmann Klein. It’s free to sign-up and you get resources aligned to Common Core standards on immigration and citizenship. There are even creative lessons on Native American history and citizenship just in time for National Native American History Month! We have just released Typing Tournament.com http://typingtournament.com complete with a free typing speed test. It has one minute and three minute free typing speed tests. These free tests gives you a quick and accurate snap shot of your typing speed. Once finished you can print a certificate and then if you like take a free trial of the full Typing Tournament Online. Works on Windows PCs, Apple Macs, Surface Tablets, iPads, Chromebooks and other Android tablets. This is a very nice list of resources! If you are working with ELL students please check our website as well- http://busyteacher.org. My daughter wanted me to share this free coding website, she and her friend like it. We found out about it while we read a book from our library about coding. The above free online “How To Tutor” program can be used to teach reading to beginners of all ages, older students in need of remediation, non-readers, adults who wish to improve their reading skills, dyslexics, the learning disabled, and non-English speakers who wish to learn to read English and improve their pronunciation. I think free education is the best way to teach the new generation who can’t afford educational institutes fees and their Expenditures.